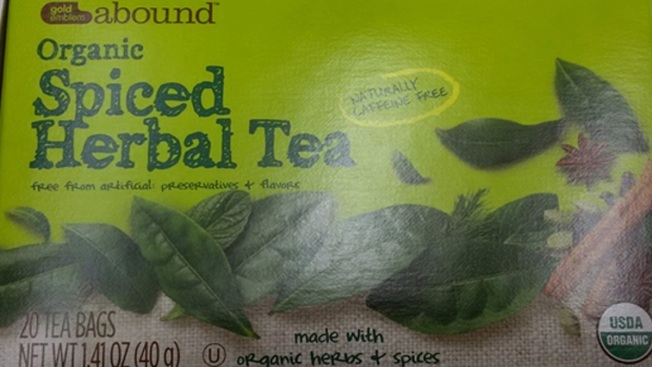 Gold Emblem Abound Organic Spiced Herbal Tea, which was voluntarily recalled April 24 by CVS Pharmacy. CVS Pharmacy is recalling Gold Emblem herbal tea over possible salmonella contamination, according to the Food and Drug Administration. The voluntary recall applies to 1.41-ounce containers of Gold Emblem Abound Organic Spiced Herbal Tea. About 200 cases were sold nationwide, the FDA said. Affected containers have a best-by date of March 18, 2018, and the UPC code 0 50428 541043. It comes after the manufacturer notified CVS of potential salmonella contamination, the FDA said. No illnesses have been reported. CVS has removed all the affected product from stores and added a "do not sell" block to its register system, according to the FDA. Consumers who purchased the product can return the item to CVS for a refund. Contact 1-800-SHOP-CVS between 8:30 a.m. and 7 p.m. Monday through Friday for more information.